(NEWS 8) - When an employee of Anderson Plumbing Heating and Air asked for some time off so that he could travel to Houston to help immediate family members whose lives were turned upside down by Hurricane Harvey, his bosses were more than willing to lend him time. Brent Watkins grew up in Houston and has since moved to San Diego. His mother still resides in the Magnolia City and had her home destroyed by the storm, and other immediate family members suffered as well. Watkins needed to get back to his hometown to be at their side, and after he shared his personal connection to the disaster with his employer and colleagues his one-man road trip turned into a convoy for donations collected from the local community. With his good friend George Perez as his co-pilot, Watkins is headed east to Houston this Thursday in one of his company's biggest trucks to drop off donations directly to his family and others in need. 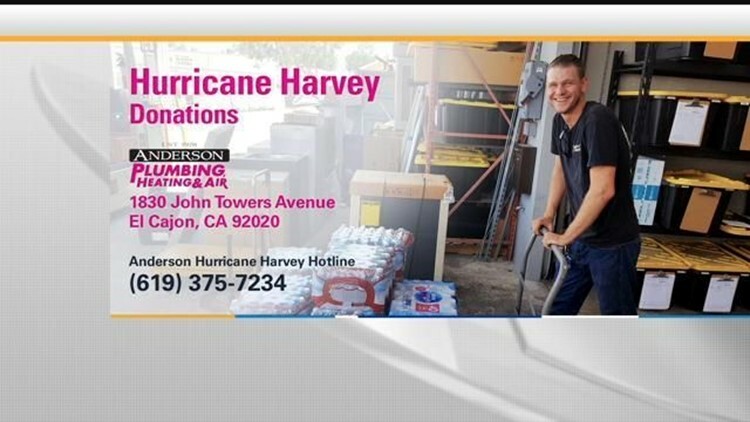 Donations can be delivered to Anderson Heating & Air at 1830 John Towers Avenue in El Cajon from 7 to 7 p.m. on Tuesday and Wednesday. For large deliveries or deliveries outside the specified time range, call the Anderson Hurricane Harvey Hotline at (619)375-7234.